As humans, we get so excited because we crave knowing more about ourselves or our lives…How we’re doing…what we can improve on. We all want to make our lives better and we think quizzes will give us this knowledge. And as an online business owner, it’s even more important. Because the larger your list, the bigger the sea of potential customers and sales. Ca-ching, ca-ching! So today’s your lucky day, my friend! Because you’re going to see exactly how to use both of these things together to explode your email list AND get people excited about you! “With Interact Quizzes.” I answer. Experience it yourself, by taking my quiz below! Then, I’ll walk you through making your own easy, fantastic, lead-generating quiz. And integrating it with your email marketing service to make your life so much easier! 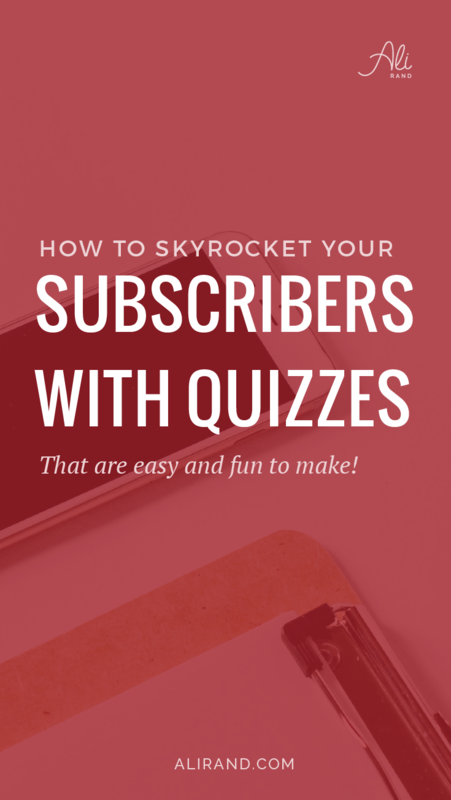 So if you’ve researched ways to grow your email list, I’m sure you’ve come across quizzes. I know I did, but I didn’t know much about it. Or how to do it. “It’s probably complicated…” I thought. Although I knew it was fun! And I’m sure you’ve done a silly BuzzFeed quiz at one point or another! Or that NY Times one about what part of the country you talk from. So you know how great they are. 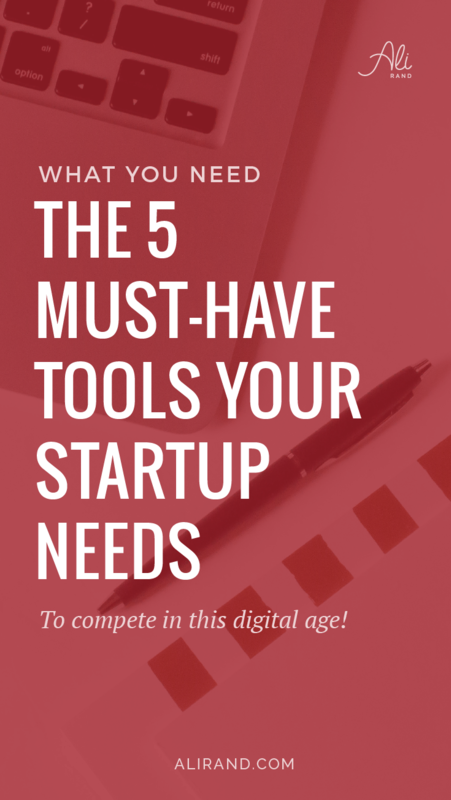 And so it’s time you use them in your business. At least try it out to see the results. Because if you never try it, you’ll never know how successful it could be! So you’ll first need to research companies in order to MAKE a quiz. 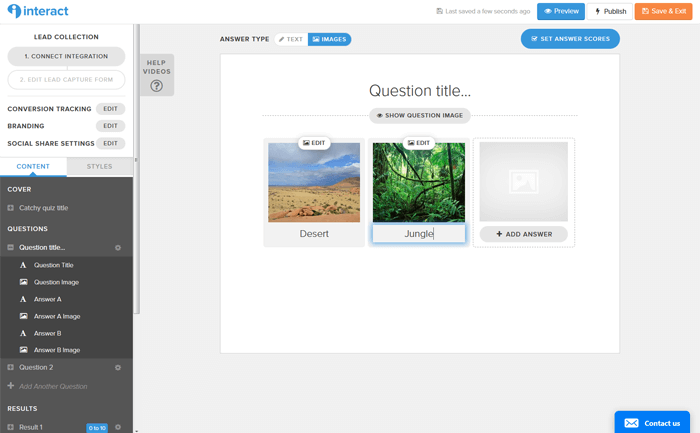 There’s a lot out there, but the one I’m going to walkthrough you today is Interact Quizzes. 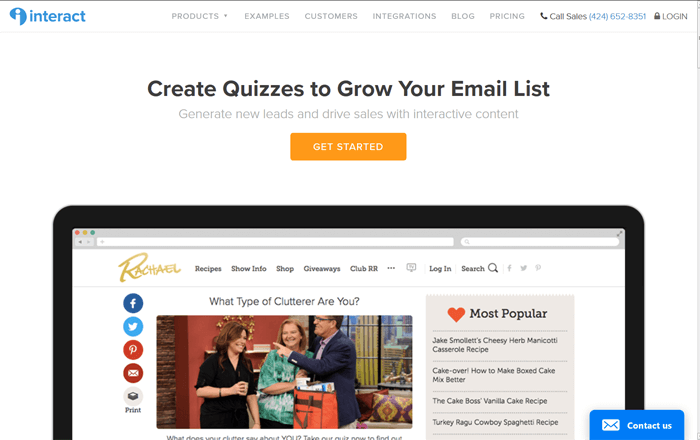 They make creating your quizzes and integrating them with your email marketing SUPER easy. Trust me, if you think you’re “tech-challenged,” you’ll still have no problem! And you don’t even get just one type of quiz with your plan! So no matter what type of experience you want to give people, they’ve got you covered! So if you’re ready to follow along and create your OWN fantastic quiz, create an account and let’s get started! 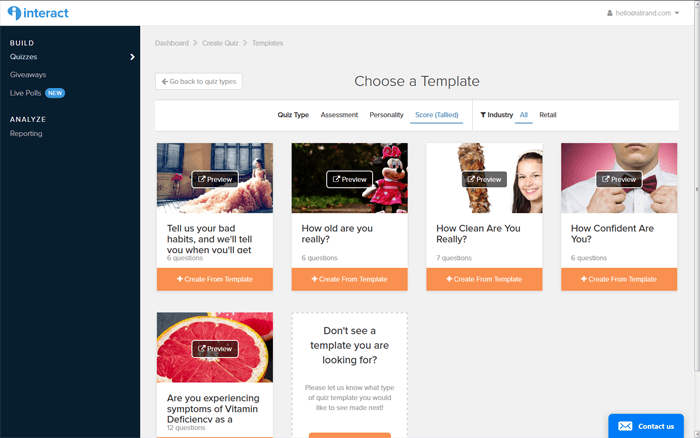 After you create an account, you’ll be directed to your Interact Quiz dashboard. 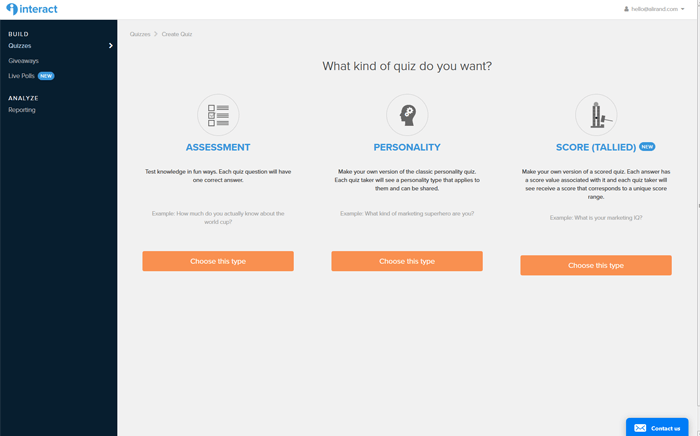 Here, you can see what your quiz creation options are (and see an example of what each quiz type is). An assessment quiz tests how much you know about a topic. It’s great for all those trivia fans out there who like seeing how much they really know. And you can create it in your topic. This is one is really popular, as people love to analyze their personality. You come up with questions whose answers correspond to different personalities. LIke what color are you? What city should you live in? These can be very broad and people love sharing their results! For these quizzes, each answer is scored on a scale. And at the end, your answer scores are tallied and the result is shown based on your score. That’s what type my quiz is! I’ve chosen questions where the more user-friendly feature has a higher score. So if you score enough points, you’ll get a “Very User-Friendly” result (good on you!). Also on the sidebar are the options for Giveaways and Live Polls. If you want to get a lot of subscribers at once, giveaways are a good option. People will give you their info for the chance to win whatever you’re offering. Although, sometimes these leads aren’t the best, as they’re just looking for free things and may not want to actually buy what you’re selling. Live Polls are a new feature to be used when you’re live streaming. You can see in real time what your viewers think when you ask a poll question. Step 3: Build Your Quiz! So now you know what the types of quizzes are available. And the next step would be to choose which one you want to build (I know what you’ve been waiting for!). 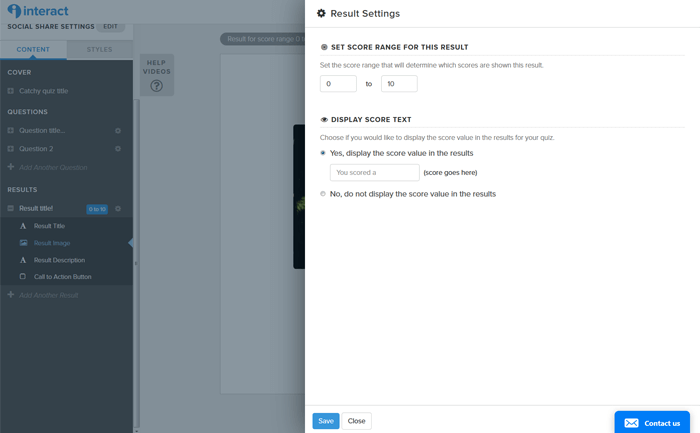 I’m going to walk you through a Scored (Tallied) quiz, so you can see just how easy it is! So, on your dashboard, you’ll click which quiz you want. 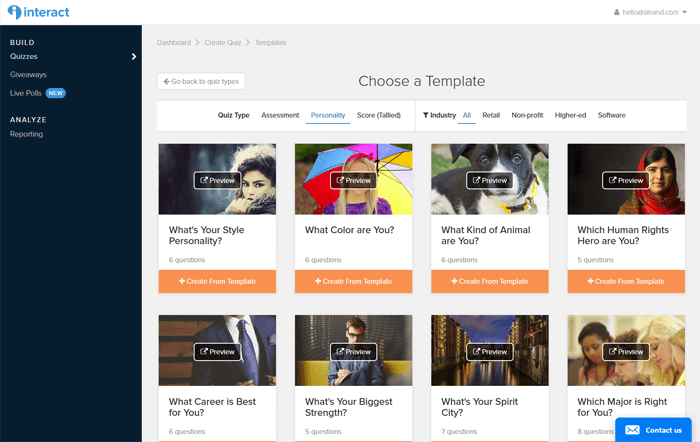 Then you’ll have to decide whether to choose a template or build from scratch. 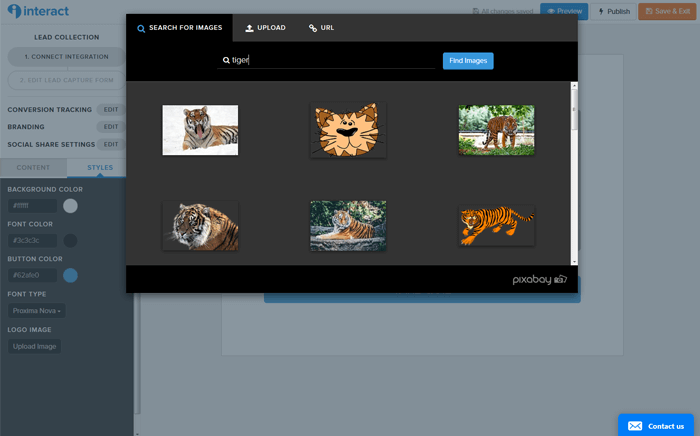 The templates are already done for you – tested and ready to go! All you’d have to do is select one, edit anything you need, and publish it! And there are SO many options out there; you’re almost certain to find something you could use. 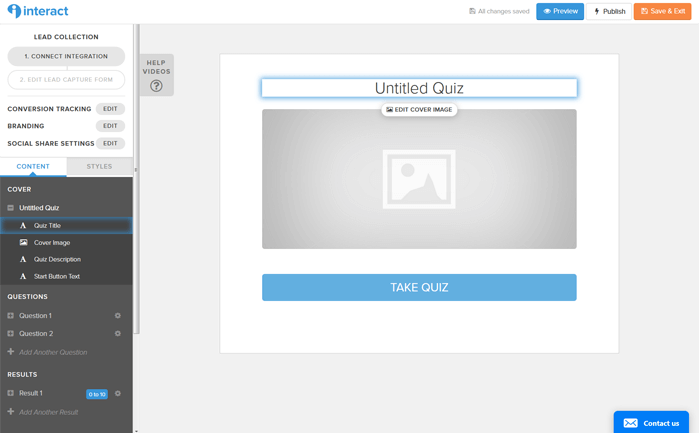 Once clicked, you’re ready to start creating your quiz! Let’s go over your screen so you know what to do where. First, you have your left sidebar. It’s awesome as it shows you exactly what can be edited for each section. There’s 2 tabs on the sidebar. The first is Content. Here you’ll see your quiz title, answers, etc. Clicking on each one will then activate the option to edit it in the middle of the screen. Or else you can click on the main area to also edit it. In the sidebar, you can add new questions or new results by clicking the + sign for the respective ones. The other tab is called Styles, and can further customize how it shows up – from button color, font, etc. Above the sidebar is your integration settings, which we’ll cover later. You’ll want to give your quiz a title, which you can do by typing in the “Untitled Quiz” box that comes up when you hover over it. There are help videos along the way that can give you guidance on what makes a great quiz, which is handy when you’re just starting out. You want your title to be catchy and MAKE people want to take it. You don’t want it too long either. Just something short and compelling. Then you’ll want to pop in a cover photo. Because it’ll help convert people. 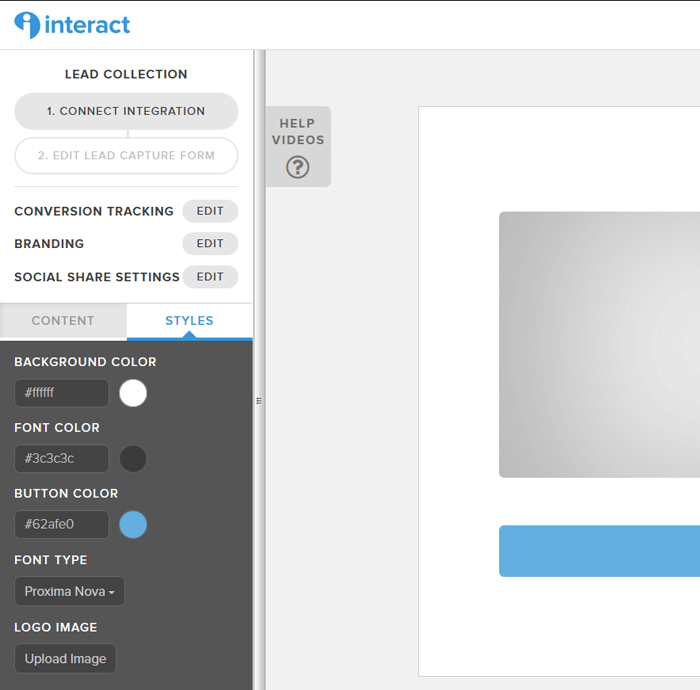 Interact has found that if your cover photo has just one person in it, it’s better at converting. And what’s nice is that when you click to edit the cover image, they provide some free photos you could use. Save you the headache of finding, downloading, and making it the right size. However, if you do want to create your own cover image, they tell you what the dimensions should be and it’s easy to upload. Then, you’ll want to enter a short description under the cover image. Something more about what this quiz is, who should take it, etc. So once your title is all set, it’s time to dive into the questions! Go to the sidebar and click “Question 1.” Then you’ll want to pop in your first question by clicking in the Question Title box. What’s also so cool about these quizzes are that you can have images for the question AND the answer if you want. People would prefer to look at images, so use that to your advantage when developing your quiz. Make sure your question has an image! To change the answer type to image, simply click the button at the top. You can always revert back by clicking the button again. So pop in your answers and/or their accompanying images. You’re given 2 answers by default, but you can add more by clicking the “Add Answer” button beneath Answer B. And the last thing you’ll want to do in this Scored quiz is to set the answer scores! There’s a big blue button in the top right corner, and just click that. A window will fly open and you can set the score for each one. You should know beforehand how you want each answer to be scored to make it easier. It also depends on how many answer choices you have. Whether you do -1 and 1 or 0, 1, 2, 3, etc. Just make sure you stick to a consistent scoring pattern. Once done, click the blue save button at the bottom. Know that you can’t change the order of the questions. You’d have to delete them and start over. So make sure you know the exact order you want your questions in! Then you can click Question 2 in the sidebar and repeat this process. And click “Add Another Question” under Question 2 in the sidebar to keep adding questions. Just know best not to make it a super long quiz. Try to stick to about 12 questions max. Ok, so now that your quiz is set, it’s time to let people know how they did in the results section! You’ll click Result 1 on the sidebar. Then you can pop in the Result Title, Result Image just like before. And add a short description about what this result means. 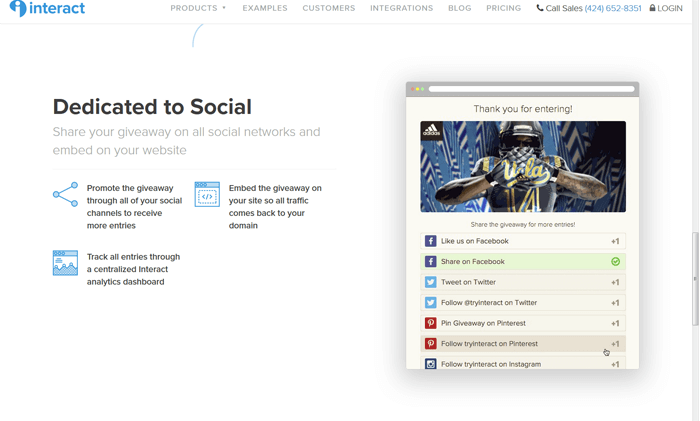 You’ll also want to link to your site or another call to action to keep visitors engaged. 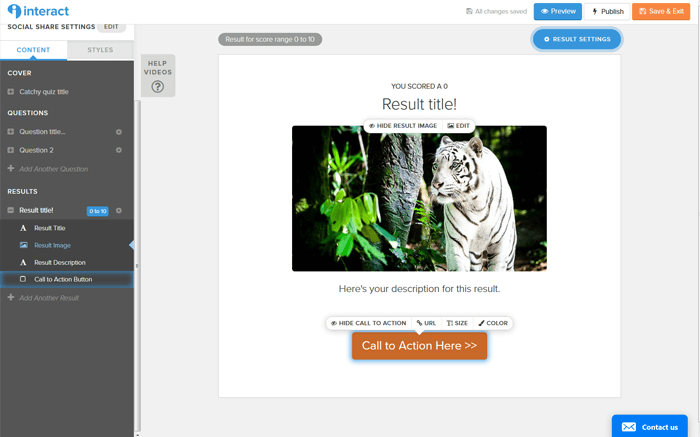 You can also change the Call to Action and link it to where you want visitors to go. Then in the Result Setting button at the top right, you can set the range for this result. And you can even let people see their exact score if you want. You’ll then repeat this process for each result you have. You can also preview your quiz by clicking the blue button, which is nice to see! So you can make sure everything is coming up right before you publish it…and you can take your quiz to see how you scored! And while there’s a free plan with unlimited quizzes, it’s only $29/month to get lead generation. What this means is that after the quiz taker has finished the quiz (and before they see their results), they’ll be prompted to give their contact info (like name and email). 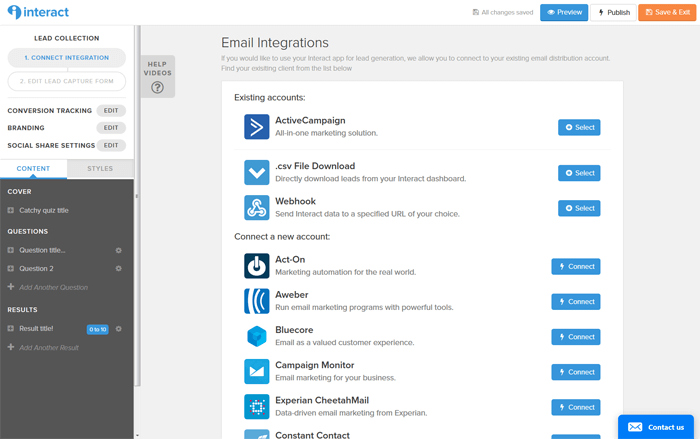 And that contact info will be sent to your email marketing provider as a new contact, like my fave, ActiveCampaign. Interact also supports SO many others, like Aweber, ConvertKit, Drip, MailChimp, and Ontraport (and Zapier if you love making zaps!). And what’s great is that you can even have follow up sequences (like automations) for EACH result! So if you want to cater the content in the email for each result, you can totally do that! And/or you can also add custom fields, which is fantastic! Because for me, I just use one Automation for all results. 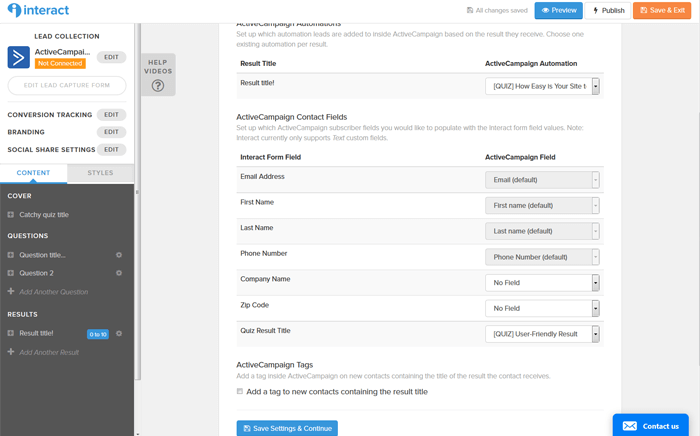 And in ActiveCampaign, I’ll create different emails to send based on the custom field of Quiz Result. That way I keep the number of automations to a minimum. So once you set up your integration, you can edit the Lead Capture form. You’ll basically want to say something about what happens when you give your info. 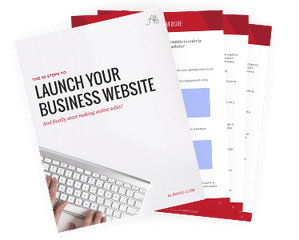 Like mine says you’ll also get a Checklist to make your website user-friendly. Which I send in the auto-responder email. Because Interact recommends you send an email immediately after the person takes the quiz. You can thank them for taking it, give them any bonus if you want, and tell them why they should stay on your email list. 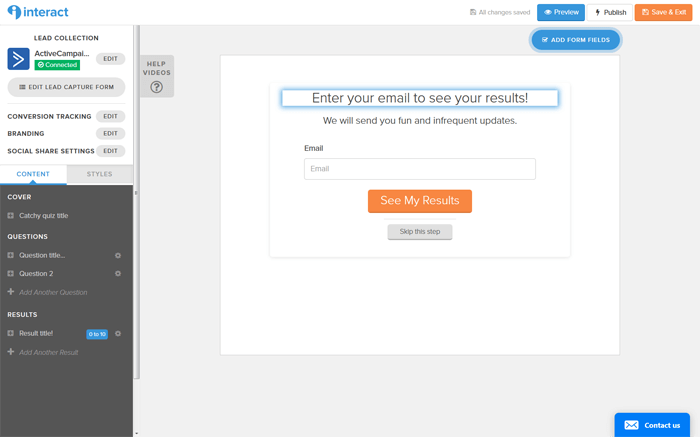 Then you can also send follow up emails catered to their results or send them to your nurture series. Or however you like to make your subscribers happy! So once you’re happy with your quiz, you’ve integrated your email marketing provider details, and have an automated sequence lined up for new contacts, it’s time to unleash your quiz on the world! 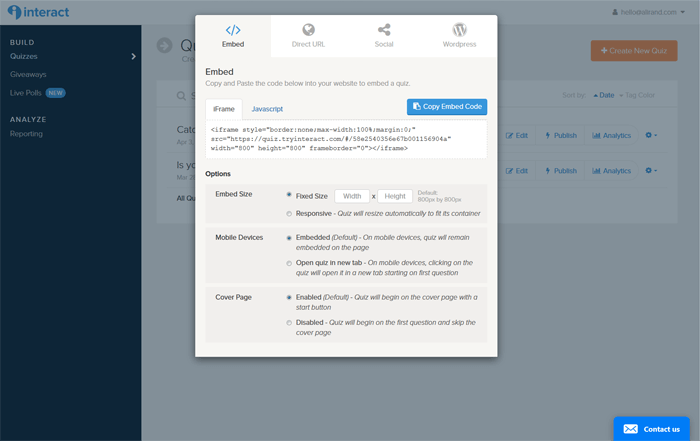 You’ll click the grey Publish button and a pop up will open with methods to embed it. Direct URL: You can give out this URL, which is the direct URL of your quiz. Social: You can share your quiz with any of the four social media networks by clicking the button. 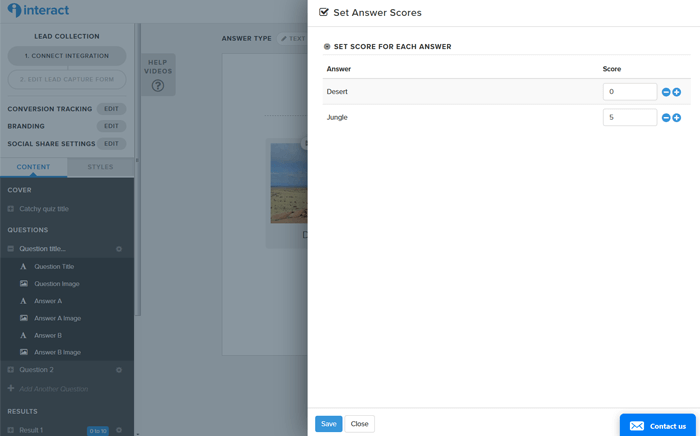 WordPress: And if you plan on using quizzes on your WordPress, you can install their WordPress plugin to make it easier with shortcodes. And once you’ve published your quiz, eventually people should start to take it! And Interact Quizzes gives you Analytics to see how well it’s performing. There’s a great chart that shows the drop-offs from each stage of quiz: viewing to taking to completing. 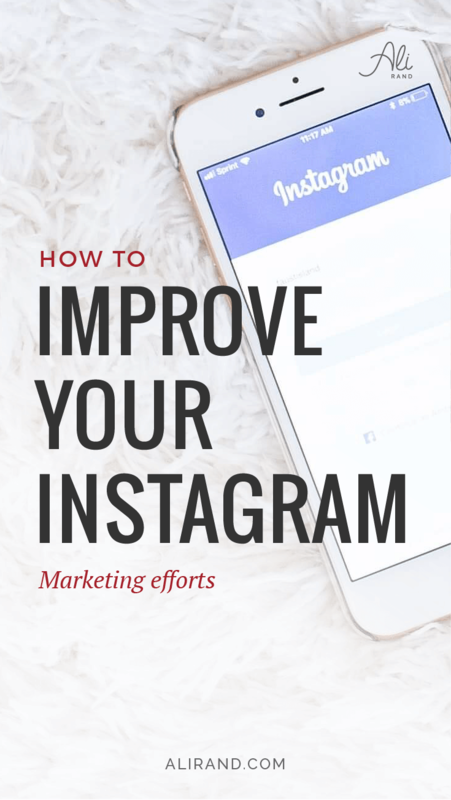 You can see the social sharing statistics and can download your leads again if there was a problem with your email marketing integration. It’s definitely helpful if you have multiple quizzes and want to see your top performers. You can better understand your subscribers or learn how to help them even more! So go on and make your own Interact quiz! And leave a comment below with your thoughts. 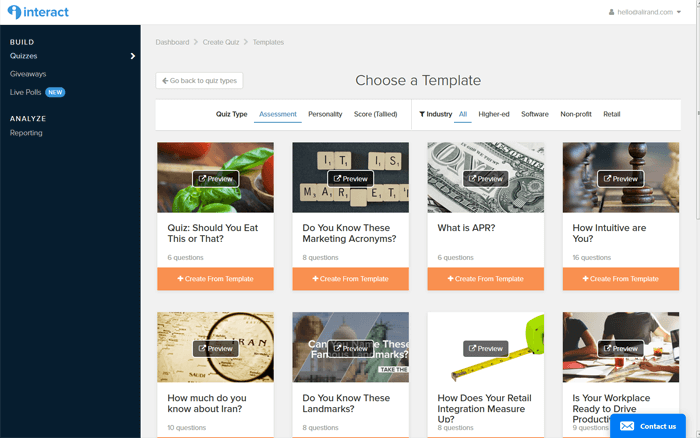 Have you used quizzes in your business? Were they successful? Thanks! Hope it turns out well for you! Awesome and really thorough post! I’ve been seeing these quizzes start to pop up everywhere lately, great tutorial showing how to make them. Definitely saving this post for later so I can create my own! Thank you Steph! Yep, seeing that too. Glad I could help you show how to use them! Thanks Bruce! Yeah, quizzes are so much fun! Glad you enjoyed this post. Wow. That is a TON of great info. Thanks so much. Thanks Kristin! Glad you found it helpful!